Rich broths and bisques are celebrated with exuberance at Le Soups! in Ferndale. Alongside fun-named soups like "kickin' crab corn chowder", they also serve Chesapeake cheddar and crab, gumbo, lobster, mushroom and tomato basil bisques, creamy artichoke and chicken, beef barley, green chili corn chowder … you can enjoy a different soup every day, and it’ll take a while before you repeat yourself because every day there is a selection of ten soups: four regulars and six specials. 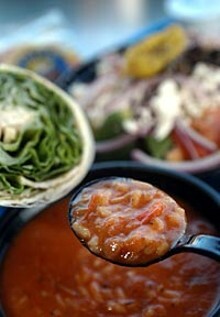 Vegetarians can even dig in, with such vegetarian offerings as vegetable or portabello mushroom soup.